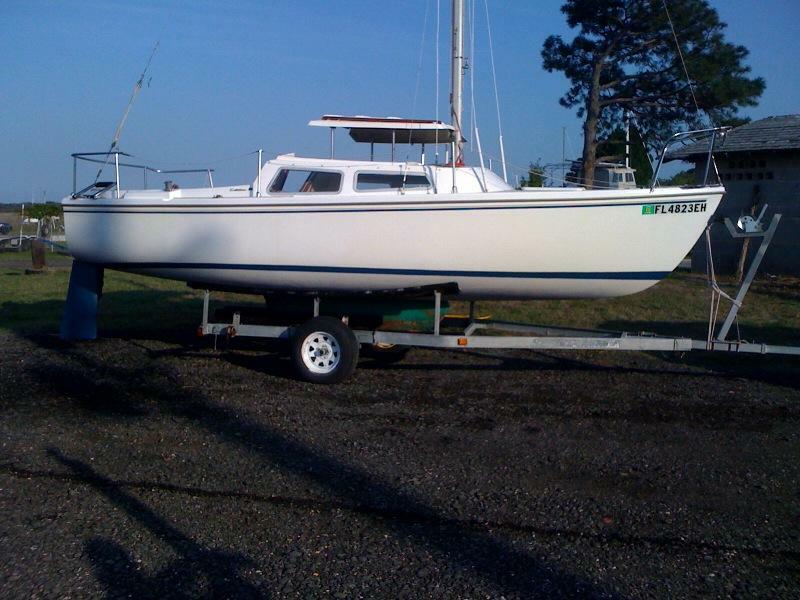 Nicely restored 1984 Catalina swing keel pop-top model on very nice trailer with extending tongue and nearly new tires plus spares and rims. Redone inside and out. All exterior and interior woodwork refinished last year. Non skid added to cabin top last summer. Deck, cockpit and remainder of cabin top repainted with white Brightsides Polyurethane last summer. Pivot pin assembly refinished. Rewired last summer. Standing rigging in very good shape. New forestay added last year. Two mainsails, 150 genoa, head sail, smaller storm jib and spinnaker, sail bags, wisker pole, new Hummingbird depth/fish finder (transducer recently mounted inside forward hull, two new batteries (one never used, 2010, fire extinguisher, porta potti, fenders, Danforth anchor, chain and line with extra anchor line, pop top cover, kick up rudder with refinished tiller handle, compass, canvas companionway cover (vented), rubber interlocking dry mats in cockpit and sole, life jackets and more.